You want to do art at home but it seems rather daunting. Which supplies? What to teach? Where to start? And how in the world do you manage all the messes? I get it. And I'm here to help! First, let me ENCOURAGE you! You can do this! It's easier than you think! The skills you already use to homeschool your children in other subjects are going to help you do art too. You don't even have to be that artistic. When you choose a unit your kids are interested in and allow me to be their online teacher, all YOU have to do is get a few things set up! You'll need a space for your kids to work with access to a computer or tablet device and some art supplies, and yes, a strategy for dealing with clean-up. You'll also need to decide when art will happen during the week and be intentional about how you can best encourage your young artists. My Step by Step Create at Home Guide is a great place to start. It will take you through 6 short, easy steps to get everything set up and make sure you don't forget anything. My Quick and Easy Clean-up Tips gives you 10 ways to manage the mess. These are my BEST tips from 14 years of teaching art! My How to Encourage Your Young Artist guide is perfect for those times your child shows you their art and you don't have a clue what they've drawn! There are 7 ideas here that will help you support and motivate your child as they do art at home. I use all of them with my own kids and they WORK! You can also find some great information about how to set up a great home art studio for your kids on the PARENT RESOURCES page. I like to think of art supplies in terms of NEED TO HAVE and NICE to HAVE. There are those supplies you need for pretty much everything. And then there are those extra ones that are needed for specific techniques or that added pizzazz. My NEED to Have Art Supply Checklist lists all of the basics. With the supplies on this list you can do 90% of the lessons in my units. I also created a NICE to Have Kids Art Supplies Board over on my Pinterest site. I frequently add products and supplies I find that are the fun extras to have on hand! You don't want "craft" supplies. Too crummy! Craft supplies, while inexpensive, are usually poor quality. They don't last. They don't hold up over time. And they don't produce the rich, saturated pigments that make for a satisfying user-experience for your young artists. You don't want studio-grade supplies. Too expensive! While nice to have, studio-grade artist supplies are very costly and aren't really made with kids in mind. They don't hold up to rigorous kid use and are harder for little hands to use. Your goal will be for your kids to manage and care for their supplies on their own so you really need something that enables them to have success with this. You want the JUST RIGHT supplies! You want to strike a balance between crummy crafts and super-expensive studio supplies. Supplies that are nice quality but won't break your piggy bank. Once you get set-up and gather your supplies all you need to do is Join the P.A.C.K! P.A.C.K. is my Project Artwork Club for Kids. It’s an online art club for ages 5 and up that provides members with access to a wide array of video art tutorials and a host of other benefits! Kids can earn “patches” or printable merit badges for completed projects and have the opportunity to have their art featured in our online gallery. Joined the P.A.C.K. community but aren’t sure where to start? My "Blobs!" series is a great first unit! 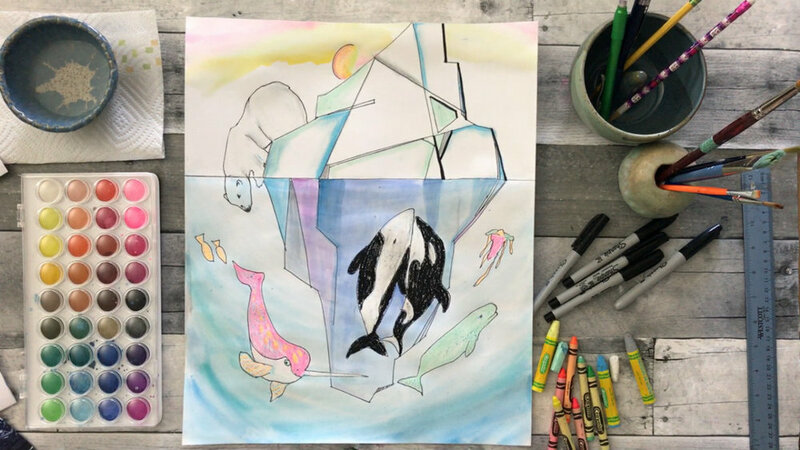 It has a wide range of projects from super-easy Foldprints, to the more challenging Manatee Drawing and works well for a wide variety of ages. Want you child to learn a little art history? My Famous Artist Mash-Ups unit has some fabulous projects your kids can make all while learning about 10 different artists and their unique styles. Need help getting in the holiday spirit? My Arctic Wonders series has some gorgeous wintry projects your kids could make over the Christmas break to give as gifts!